Charlestown is the oldest neighborhood in Boston, originally laid out in 1629 by early settlers. 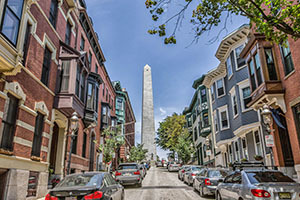 Set on a peninsula that separates the Charles and Mystic Rivers north of downtown, it is nonetheless part of the City of Boston and contains numerous historical landmarks such as the Bunker Hill Monument, the Charlestown Navy Yard, the U.S.S. Constitution, and the Boston National Historical Park. Paul Revere began his famous ride from Charlestown, and the northern part of the Freedom Trail runs through the neighborhood. The neighborhood had and continues to have a large Irish-American presence and identity, in spite of gentrification in the 1980s and 1990s. The neighborhood contains Bunker Hill Community College as well as the MGH Institute of Health Professions, and the Charlestown Working Theater, a stronghold of the small theater community in Boston. Charlestown's City Square and Main Street form the area's commercial heart. Monument Ave Single Family with newly landscaped private patio, offers the best of original detail & attractive modern conveniences. The gracious entry provides views front to back & elegant staircases. Sunny Monument Ave living room views, a decorative marble fireplace, built-in cabinetry and entry to the dining room. Dining room overlooking the landscaped patio has access to a well-appointed wet bar. Staircase to family room/kitchen opens to patio. Family room includes built-in shelving and cabinetry, window seat and large greenhouse style windows that look out to patio. Kitchen,with an island, granite counter and custom built ins, includes refrigerator, gas cook top & access to laundry, mud room with second refrigerator, powder room & direct access from Monument Ave. Master bedroom suite has high ceilings, a sitting room/ library with an original marble fireplace; an office in a bay overlooking Monument Ave; plus a full bathroom. Two bedrooms; bathroom; & office on top floor. Tucked just off Monument Square, this 3BR/1.5BA single family home features an ideal layout and excellent expansion opportunities. The beautiful main level offers a sunny open living/dining great room w/custom built-ins, three exposures, and French doors leading out to the enclosed garden patio; a chef's kitchen with custom white cabinetry, stainless Jenn-Air appliances, gorgeous soapstone countertops, exposed brick, a butcher block prep area w/dedicated prep sink, and windows overlooking the garden; and a half bath. The second level features two spacious bedrooms each w/sunny corner exposure and generous closet space, and a luxurious full bathroom w/marble topped vanity, claw foot tub, glass enclosed shower, mosaic tile floor, and walk-in closet. The third bedroom, w/walk-in closet and skylight is located on the top level. The full, unfinished basement w/great ceiling height offers expansion potential. Amenities include: C/Air w/Nest, laundry center, rental parking secured nearby. Well located in the historic Francis B. Austin House, this stunning 2BR/1.5BA duplex features 1,156sf of newly renovated living space, a private cobblestone patio, and 1 car parking. The open layout features a chef's kitchen with large island, custom white cabinetry, stainless KitchenAid appliances, River White granite countertops, and a pantry; a dining space w/adjacent built-in bar area; and a beautiful living room w/gas fireplace and direct access to the enclosed patio. Two spacious bedrooms, each with soaring ceilings, intricate moldings, corner exposure, generous closet space, and gleaming pumpkin pine floors, and a luxurious full bath with double vanity w/honed marble countertops and tub w/marble tile surround, are located on the upper level. Amenities include: C/Air, in-unit W/D, and storage. This gorgeous mansard building, listed on the National Register of Historic Places, is located in town center offering convenient access to Charlestown's shops, restaurants, and the MBTA. This is the condo with the views on the West wing! Watch the July 4th fireworks from your living room! Well designed 2 bedroom , 2 bath condo with walls of windows facing the city skyline and harbor directly! Formal foyer entry leads to the open living/dining area with incredible light from the over sized windows! Custom maple burled kitchen cabinets accent the granite counter tops in the chef's kitchen. Great usable storage space! Master bedroom with huge walk in closet, washer/dryer and spa bath. 2nd bedroom has a Murphy bed and small office space in closet. Full bath for guests! One valet space in the lower garage is included as well as access by elevator to the West wing lobby, exercise fitness room, 24 concierge hot water and most of the heat and AC energy costs. Watch for the city water shuttle arrival from your condo! Minutes from downtown, restaurants, marinas , parks, highways and Logan International airport. Flagship Wharf is a luxury waterfront building. Ahoy! Step out of the pages of Coastal Living and into 48 Constellation Wharf! This professionally designed, recently updated 3-4 bedroom townhome offers the ultimate in waterfront living with an unparalleled combination of unit size, luxury finishes, two of the largest decks in the complex, & covered parking for 2 cars. This "bridge" unit is unique in that it has panoramic, unobstructed water & city views from every room offering you complete privacy. Gourmet, all-white Chef's kitchen with Sub-Zero fridge, state of the art appliances & quartz countertops has serene views of passing ships. The adjacent dining room & sunken living room with wood-burning fireplace & deck is perfect for sea-side entertaining. The master bedroom with en-suite bathroom offers you complete luxury. First floor has guest bedroom, full bath & additional living space-perfect for guests! Friendly secure neighborhood in gated community surrounded by parks. Convenient harbor ferry service to downtown. Not to be missed! Sundrenched and spacious 3 bedroom, corner unit condo, located in a professionally managed elevator building. The living room has high ceilings, giant windows, and a fireplace. Great natural light pours into the kitchen that showcases granite countertops and stainless steel appliances. Additional amenities include a washer and dryer in unit and central A/C. Close to town center, shops, restaurants and the MBTA, this condo is an amazing value and one you don't want to miss! Enjoy waterfront, luxury living in Charlestown's Navy Yard. With close proximity to downtown Boston, easy access to the highway or the water taxi into the Seaport, and all of the charm of Charlestown right at your doorstep, this location offers the coastal and city lifestyle all in one. Located in a full service, elevator building that boasts countless amenities such as 24/7 concierge, fitness center, clubroom, business center, outdoor pool, laundry facilities and valet garage parking included. This move-in ready, 2nd floor condo features an open floor plan, exposed brick, wood floors, granite & stainless steel kitchen, gas cooking, central ac and an updated bathroom. This meticulously maintained single level condo boasts high ceilings and a large open concept living/dining room, great for entertaining! There is a private deck off the back of the unit as well as dedicated laundry area and an additional storage room just a few steps down from the main level. Located on a one-way side street just a short distance from all that Charlestown has to offer, and convenient to downtown Boston.